We were proud to receive several awards from the Federation of Film Societies, presented by Tony Curtis, Derek Malcolm and Mike Leigh, and are signifying this by screening one of Mike Leigh’s best films ‘Secrets and Lies’ (1996). Mike Leigh also made two personal appearances at New Park including introducing a retrospective of his films in 1990. The Cinema’s third name change became the present ‘Chichester Cinema at New Park’. – Roger Gibson. This hilarious, bittersweet comedy from director Mike Leigh is an unmissable and moving slice of real life. Hortense (Marianne Jean-Baptiste) is a young, black optometrist whose adoptive parents have recently died. Cynthia (Brenda Blethyn) is a sad, unmarried mother who works in a factory and lives in a shabby terraced house with her confrontational daughter Roxanne (Claire Rushbrook). Cynthia's brother Maurice (Timothy Spall) is a successful photographer who lives comfortably in suburbia with his wife Monica (Phyllis Logan). In a misplaced effort to re-unite the family, Maurice and Monica throw a small barbecue party for Roxanne's 21st birthday. When Cynthia brings along her new friend Hortense, chaos ensues, and some painful truths are revealed. 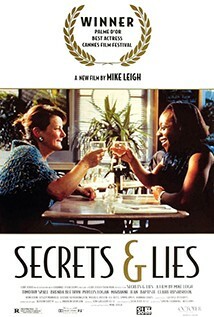 Probably Mike Leigh's biggest international success, after winning the grand prize at Cannes.